Best coffee makers for under $100. The Cuisinart DCC-1200 Brew Central 12-Cup Programmable Coffeemaker for under $100. As soon as your coffee maker budget increases from $50 to up to $100, a whole new world of choices opens up. You can take your pick from a wide range of drip brewers, and also have the budget to look at some grind and brew coffee makers and some single serve brewers too. There are plenty of drip brewers you can buy for under $50, so when your budget goes up to under $100, you simply have more choices and can choose machines with a lot more features. 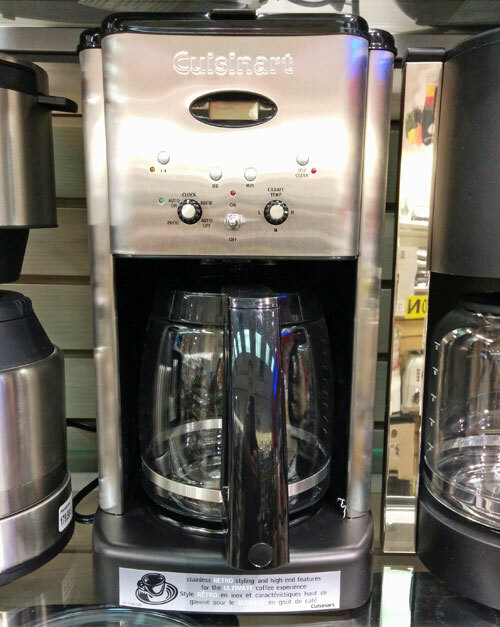 One of the most popular and most reliable drip brewers for under $100 is the Cuisinart DCC-1200 Brew Central 12-Cup Programmable Coffeemaker . It offers a number of neat features like a built-in water filter, gold-tone permanent filter and a fully programmable brew timer. Grind and brew coffee makers. There a few grind and brew coffee makers you can buy for under $100. These are the brewers that include a coffee grinder within the same unit as the brewer. You simply add whole coffee beans, press the brew button and then the machine grinds and brews your coffee. From a taste point of view, grind and brew coffee makers are an excellent choice, because your coffee will always be fresh-ground and fresh-brewed. Within this price range we recommend the Cuisinart DGB-625BC Grind-and-Brew 12-Cup Automatic Coffeemaker . These are the brewers that make just one cup of coffee at a time, using either sealed coffee pods or K-Cups. If you would prefer one of the Keurig K-Cup brewers, there are two brewers within this price range, the Keurig B40 Elite Brewing System and the Keurig B130 Brewing System . They make coffee in the exact same way as the more expensive models, but without the extra bells and whistles. The B40 is the same size as the others, while the B130 is much smaller, designed for use where space is at a premium, whether that be at home or in your RV.